Early concepts in covalent bonding provided this type of image of a molecule of methane. Here, four hydrogen atoms are bound to a central carbon atom by four covalent bonds. Each covalent bond is formed by the sharing of two electrons—one from the carbon atom and one from a hydrogen atom. A covalent bond is a type of chemical bond characterized by the sharing of a pair of electrons between two atoms. The electron pair interacts with the nuclei of both atoms, and this attractive interaction holds the atoms together. The covalent bond is much stronger than the hydrogen bond (between polar molecules) and is similar in strength to or stronger than the ionic bond. Covalent bonding occurs most frequently between atoms with similar electronegativity values. It plays a particularly important role in building the structures of organic compounds (compounds of carbon). Each carbon atom can form four covalent bonds that are oriented along definite directions in space, leading to the varied geometries of organic molecules. Moreover, numerous chemical reactions, in both living and nonliving systems, involve the formation and disruption of covalent bonds. In the Electron Dot Notation, the dots represent electrons that are involved (or have the potential to be involved) in forming covalent bonds between atoms. Alternatively, each covalent bond (electron pair) may be represented by a solid line. The idea of covalent bonding can be traced to chemist Gilbert N. Lewis, who in 1916 described the sharing of electron pairs between atoms. He introduced the so-called Lewis Notation or Electron Dot Notation, in which valence electrons (those in the outer shell of each atom) are represented as dots around the atomic symbols. Pairs of these electrons located between atoms represent covalent bonds. Multiple pairs represent multiple bonds, such as double and triple bonds. Some examples of Electron Dot Notation are shown in the figure on the right. An alternative style, in which bond-forming electron pairs are represented as solid lines, is shown alongside. The sharing of electrons between atoms allows the atoms to attain a stable electron configuration similar to that of a noble gas. For example, in a hydrogen molecule (H2), each hydrogen atom takes part in the sharing of two electrons, corresponding to the number of electrons in the helium atom. In the case of methane (CH4), each carbon atom shares an electron pair with each of four hydrogen atoms. Thus, each carbon atom in methane shares a total of eight electrons, corresponding to the number of electrons in the outermost shell of an atom of any of the other noble gases (neon, argon, krypton, and radon). In addition, each covalent bond in a molecule is oriented toward a certain direction in space, thereby giving the molecule its characteristic shape. For example, a molecule of methane takes the shape of a tetrahedron, with the carbon atom at the center. While the idea of shared electron pairs provides an effective qualitative picture of covalent bonding, quantum mechanics is needed to understand the nature of these bonds and predict the structures and properties of simple molecules. Walter Heitler and Fritz London are credited with the first successful quantum mechanical explanation of a chemical bond, specifically that of molecular hydrogen, in 1927. Their work was based on the valence bond model, according to which a chemical bond is formed by overlap between certain atomic orbitals (in the outer electron shells) of participating atoms. In valence bond theory, molecular geometries are accounted for by the formation of hybrid atomic orbitals through the combination of normal atomic orbitals. These atomic orbitals are known to have specific angular relationships between each other, and thus the valence bond model can successfully predict the bond angles observed in simple molecules. The valence bond model has been supplanted by the molecular orbital model. As two atoms are brought together to form a bond, their atomic orbitals are thought to interact to form molecular orbitals that extend between and around the nuclei of these atoms. These molecular orbitals can be constructed mathematically, based on the theory of "linear combination of atomic orbitals" (LCAO theory). Using quantum mechanics, it is possible to calculate the electronic structure, energy levels, bond angles, bond distances, dipole moments, and electromagnetic spectra of simple molecules with a high degree of accuracy. Bond distances and angles can be calculated as accurately as they can be measured (distances to a few picometers and bond angles to a few degrees). The covalent bond differs from an ionic bond, which is characterized by electrostatic attraction between oppositely charged ions. Yet, even in the molecular orbital model for a covalent bond, there is an implicit attraction between the positively charged atomic nuclei and the negatively charged electrons—without the atomic nuclei, there would be no orbitals for the electrons to populate. Covalent bonding is a broad concept that covers many kinds of interactions. In particular, it includes what are known as sigma (σ) bonds, pi (π) bonds, metal-metal bonds, agostic interactions, and three-center two-electron bonds (Smith and March, 2007; Miessler and Tarr, 2003). Bond order is a term that describes the number of pairs of electrons shared between atoms forming covalent bonds. The most common type of covalent bond is the single bond (bond order 1), which involves the sharing of only one pair of electrons between two atoms. It usually consists of what is called a "sigma bond." The sharing of two pairs of electrons (between two atoms) is called a double bond. An example is the double bond between the two carbon atoms of ethylene. A double bond usually consists of one sigma bond and one "pi bond." The sharing of three pairs of electrons (between two atoms) is called a triple bond. An example is the triple bond between the carbon and nitrogen atoms in hydrogen cyanide. A triple bond usually consists of one sigma bond and two pi bonds. Some transition metals, such as molybdenum and rhenium, can form quadruple bonds. An example of a quadruple bond is also found in di-tungsten tetra(hpp). Quintuple bonds have been found in certain dichromium compounds. Sextuple bonds (bond order 6) are extremely rare but have been observed in transition metals in the gaseous phase at very low temperatures. In most cases of covalent bonding, the electrons are not localized between a pair of atoms, so the above classification, although powerful and pervasive, is of limited validity. Also, the so-called "three-center bond" does not conform readily to the above conventions. There are two types of covalent bonds: Polar covalent bonds, and nonpolar (or "pure") covalent bonds. A pure covalent bond is formed between two atoms that have no difference (or practically no difference) between their electronegativity values. (Some texts put the difference in values at less than 0.2.) A polar covalent bond (according to the most widely accepted definition) is a bond formed between two atoms that have an electronegativity difference of less than or equal to 2.1 but greater than or equal to 0.5. When a covalent bond is formed between two atoms of differing electronegativity, the more electronegative atom draws the shared (bonding) electrons closer to itself. This results in a separation of charge along the bond: the less electronegative atom bears a partial positive charge and the more electronegative atom bears a partial negative charge. In this situation, the bond has a dipole moment and is said to be polar. The polar covalent bond is sometimes thought of as a mixing of ionic and covalent character in the bond. The greater the polarity in a covalent bond, the greater its ionic character. Thus, the ionic bond and the nonpolar covalent bond are two extremes of bonding, with polar bonds forming a continuity between them. 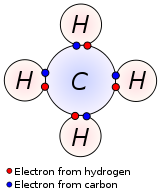 A model of ammonia-borane (H3NBH3), in which a nitrogen atom (blue) contributes a pair of electrons to form a coordinate covalent bond with a boron atom (peach). The hydrogen atoms are shown in gray. A special case of covalent bonding is called a coordinate covalent bond or dative bond. It occurs when one atom contributes both of the electrons in forming a covalent bond with the other atom or ion. The atom that donates the electron pair acts as a "Lewis base," and the atom that accepts the electrons acts as a "Lewis acid." The formation of this type of bond is called "coordination." The electron donor acquires a positive formal charge, while the electron acceptor acquires a negative formal charge. Once this type of bond has been formed, its strength and description are no different from those of other polar covalent bonds. In this sense, the distinction from ordinary covalent bonding is artificial, but the terminology is popular in textbooks, especially when describing coordination compounds (noted below). Any compound that contains a lone pair of electrons is potentially capable of forming a coordinate bond. Diverse chemical compounds can be described as having coordinate covalent bonds. Carbon monoxide (CO) can be viewed as containing one coordinate bond and two "normal" covalent bonds between the carbon atom and the oxygen atom. This unusual description illustrates the flexibility in describing this type of bonding. Thus, in the coordinate bond between carbon and oxygen, carbon is the electron acceptor and oxygen is the electron donor. The ammonium ion (NH4+), can be conceptualized as consisting of four coordinate covalent bonds between four protons (the H+ ions) and one nitrogen trianion "N3-." Coordinate bonding is popularly used to describe coordination complexes, especially involving metal ions. In such complexes, several Lewis bases "donate" their "free" pairs of electrons to an otherwise naked metal cation, which acts as a Lewis acid and "accepts" the electrons. Coordinate bonds are formed, the resulting compound is called a coordination complex, and the electron donors are called ligands. A coordinate bond is sometimes represented by an arrow pointing from the donor of the electron pair to the acceptor of the electron pair. A more useful description of bonding in coordination compounds is provided by the Ligand Field Theory, which incorporates molecular orbitals in describing bonding in such polyatomic compounds. Many chemical compounds can serve as ligands. They often contain oxygen, sulfur, or nitrogen atoms, or halide ions. The most common ligand is water (H2O), which forms coordination complexes with metal ions, such as [Cu(H2O)6]2+. Ammonia (NH3) is also a common ligand. Anions are common ligands, especially fluoride (F-), chloride (Cl-), and cyanide (CN-). A molecule of benzene may be represented as two hypothetical resonance structures. 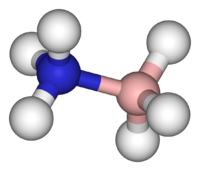 In the structure of ozone, each bond is midway between a single bond and a double bond. Many bonding situations can be described with more than one valid Lewis Dot Structure (LDS). An example is benzene (C6H6), which consists of a ring of six carbon atoms held together by covalent bonds, with a hydrogen atom attached to each carbon atom. If one were to write the LDS for the benzene ring, one would get two similar structures, each of which would have alternating single and double bonds between the carbon atoms (as shown in the figure). Each structure, if taken by itself, would suggest that the bonds between the carbon atoms differ in length and strength. 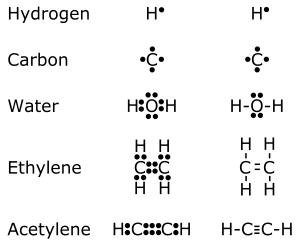 In reality, the six bonds between the ring carbon atoms are all equally long and equally strong, indicating that the bonding electrons are evenly distributed within the ring. To take this situation into account, the two structures are thought of as theoretical "resonance" structures, and the actual structure is called a resonance hybrid of the two. Electron sharing in the aromatic structure is often represented by a circle within the ring of carbon atoms. The benzene ring is an example of what is called an aromatic ring, and aromatic compounds constitute a major class of organic chemical compounds. A second example is the structure of ozone (O3). In an LDS diagram of O3, the central O atom would have a single bond with one adjacent atom and a double bond with the other. Two possible structures can be written, in which the single and double bonds switch positions. Here again, the two possible structures are theoretical "resonance structures," and the structure of ozone is called a resonance hybrid of the two. In the actual structure of ozone, both bonds are equal in length and strength. Each bond is midway between a single bond and a double bond, sharing three electrons in each bond. ↑ In general, a chemical bond is defined by a mutual attraction between atoms that holds them together in the formation of a molecule, crystal, or polyatomic ion. Clark, Jim. 2000. "Covalent Bonding - Single Bonds." Chemguide, U.K. Retrieved December 15, 2006. Clark, Jim. 2000. "Coordinate (Dative Covalent) Bonding." Chemguide, U.K. Retrieved December 15, 2006. Miessler, Gary L., and Tarr, Donald A. 2003. Inorganic Chemistry, 3rd ed. Upper Saddle River, NJ: Pearson Prentice Hall. ISBN 0130354716. Smith, Michael B., and March, Jerry. 2007. March's Advanced Organic Chemistry: Reactions, Mechanisms, and Structure, 6th ed. New York: Wiley-Interscience. ISBN 0471720917. This page was last modified on 9 December 2017, at 16:16.